For thousands of years the humble onion has had a respected and often revered place in the diet of man. Sacred to the Egyptians, it often appears in the art of ancient India, China and Greece, but it probably originated in Central Asia . The onion’s unique properties have ensured its constant popularity throughout the civilised world. It has been used through the ages to relieve cramps, strengthen the heart and as a diuretic. The onion is rich in vitamin C and contains large amounts of sulphuric etheric oils, which stimulate the mucous membranes of the digestive organs, enabling a greater absorption of nutrients. It prevents fermentation processes, protects the intestines from harmful bacteria and stimulates bile flow. Externally, the onion can be used to quickly heal an infected wound. For colds and feverish conditions, a poultice to the soles of the feet will bring relief. 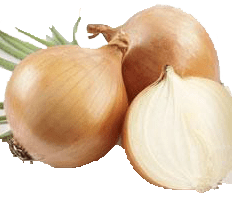 Leave half an onion beside your bed and inhale the odour overnight, as onions are the best-known air purifiers. In a sickroom, a dish of sliced onions is believed to draw away the disease and ‘absorb’ the illness, and sometimes in just a few hours, the person feels better. Remove the onion slices once they lose their odour and become discoloured and replace the dish with fresh slices. Onions are also extremely high in the antioxidant quercetin to help the body fight free-radicals and to boost the immune response. Free radicals are rogue substances that attack, damage and ultimately destroy almost any material, resulting in damaged organs, vision loss and many other health problems associated with modern living and the ageing process. Free radicals are believed to attack, damage or alter human DNA, causing cells to die, mutate and possibly become cancerous. In fighting free radical damage, the effects of aging and inflammation had better immune responses and less likelihood for cardiovascular disease. Onions are also naturally anti-inflammatory, antibiotic and antiviral, if you eat them! Onions are even linked to inhibiting certain types of cancer and it is also reported that they were used by people in Europe to successfully fight off the plague, in the early 1900’s! The onion is also a wonderful hair tonic and restorer. Simply cut an onion in half and rub it into the scalp before washing the hair.